Hatters boss Nathan Jones didn’t hold back in his criticism of midfielder Jordan Cook for getting sent off after just 33 minutes of today’s 1-0 win at Grimsby Town. The midfielder was back in the side for his first league start of the season, but saw yellow for a lunging challenge with 21 minutes gone. That alone could have seen him dismissed according to Jones, who had absolutely no sympathy for Cook’s early bath, when it arrived, booked for a second time just 11 minutes later for a late tackle on Danny Collins after the ball had already gone out. Jones said: “We brought him in because we changed shape to have a little bit more impetus and a press and an energy, so that’s why we changed shape, he’s the most natural one we have in that position, so that’s why we did it. “I know he’s not everyone’s favourite and I’ve defended him, but that’s proved to come back and bite me. “He was lucky not to go for the first one if I’m honest, so when you’re lucky not to go, as a human being you think I’ve got to be careful here, because that’s an amber, that’s not a yellow, that’s an amber. "He could have gone, then to do what he did was not a good decision. “I could put so many adjectives into it that are very strong ones of what I’ve said to him, but it’s not a good decision and I expect better from my players than to do that. “I can imagine what’s happening social media-wise and so on and so forth, but I defend him because I know what a wonderful player he is and he grafts and he wants to do well. Centre half Alan Sheehan, who was back in the side himself following a three game ban, said: “Obviously he’s going to be down, I know how he feels, you’re heartbroken as you feel like you let the lads down, but at the end of the day we won the game, so that’s all that matters. “We’re not really a selfish group, and if God said to you, 10 players, you get three points, you take that, rather than 11 players and one point and that’s the way it goes. Match-winner James Collins continued: “I think Cookie will be the first one to admit that, he’s a great lad and he said sorry to the boys, but we’ve got him out of a bit of trouble here today and that’s why we’re a team. 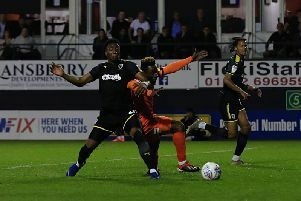 The Hatters boss however also felt that it should have been 10 versus 10 moments before half time, with Ben Davies only cautioned for his tackle on Dan Potts. He added: “There was two bad tackles in the game, Jordan Cook should have gone for his first one and I also think Ben Davies should have gone for their one. “I think Cookie’s is slightly worse, but if the referee understands what’s going on, if someone goes through and takes everything, if the other one doesn’t pull out, its a bad challenge, and I thought that was a bad challenge.